With a little over a week left until SDCC kicks off, Comic-Con International has unveiled the first part of their full Comic-Con 2018 schedule, featuring the events for Preview Night and the full Thursday schedule. We have gone through the entire schedule and pulled out the prevalent movie, TV, home video and streaming events below. It all kicks off with Preview Night on Wednesday, July 18, where fans can get an early look at the world premiere of Manifest along with New Line's spooky Scarediego event. 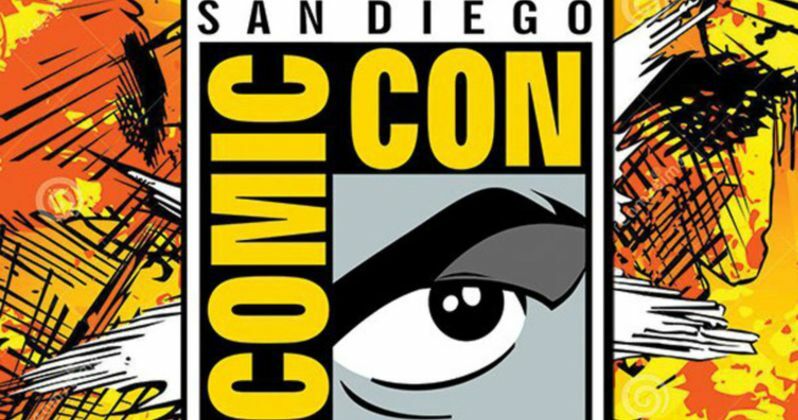 Take a look at the preview night and Thursday schedule for Comic-Con below. 6th Annual Musical Anatomy of a Superhero: From the ominous horns of Jaws or A Quiet Place signaling fear, to the heroic Star Wars theme, music has always been an important supporting character in movies. In the world of superheroes, music sets an emotional tone more than virtually any other genre. This panel offers a behind-the-scenes look at the music of today's biggest superhero film and TV projects with unreleased film clips and never-before-heard music. Participating composers include Tyler Bates (Deadpool 2, Guardians of the Galaxy 2), Marco Beltrami (Logan, The Wolverine), Christophe Beck (Ant-Man and the Wasp), Kurt Farquhar (Black Lightning), and Blake Neely (The Flash, Arrow, Legends of Tomorrow). Moderated by Ray Costa of Costa Communications. Thursday July 19, 2018. 10:00am - 10:50am. DC Collectibles: Limited-edition statues, action figures, prop replicas, busts, vinyl . . . DC Collectibles has them all-and more. The DC Collectibles crew, including executive creative director Jim Fletcher and Academy Award-winning special makeup effects artist Rick Baker and several special guests discuss how they come up with so many great ideas, and what's coming up from the maker of awesome collectibles! Thursday July 19, 2018. 10:00am - 11:00am. Room 9. Sounds of Mayhem: Music and Audio in Action Films, TV, and Video Games: Featuring creatives behind Deadpool 2, Cobra Kai, Trollhunters: Tales of Arcadia, DC Super Hero Girls, Prince of Persia, Mummy VR, Halo, God of War, and Legend of Zelda. Experts in the sound field, including composers, sound mixers, and sound editors, talk about setting tone and controlling the soundscape down to the pow of the last karate chop. Whether slaying trolls, chasing the undead, or beating the bad guys, sound is an essential part of telling stories in films, TV shows, and video games. Panelists include Leo Birenberg and Zach Robinson (Cobra Kai), Tim Davies (Trollhunters: Tales of Arcadia), Michael Gatt (DC Super Hero Girls, Braid), Mark Stoeckinger (Deadpool 2), Penka Kouneva (Prince of Persia, Mummy VR). Moderated by Chris Villain (content creator) and Bryon Burton (journalist for The Hollywood Reporter). Thursday July 19, 2018. 11:00am - 12:00pm. Room 25ABC. Charmed Exclusive Screening and Panel: The iconic Charmed is back just in time to celebrate its 20th anniversary. This reboot of the original series centers on three sisters in a college town who, after the tragic loss of their mother, discover they are powerful witches. Between vanquishing supernatural demons, tearing down the patriarchy, and maintaining familial bonds, a witch's work is never done. Please join series stars Melonie Diaz, Sarah Jeffery, Madeleine Mantock, and Rupert Evans along with producers Jennie Snyder Urman, Jessica O'Toole, and Amy Rardin for an exclusive sneak peek at the first episode of the CW series followed by a panel discussion. Thursday July 19, 2018. 11:15am - 12:15pm. Ballroom 20. You're Wrong, Leonard Maltin! : Discussing movies on social media has become a blood sport instead of a forum for debate. Leonard Maltin and his daughter Jessie, who host the "Maltin on Movies" podcast for the Nerdist network, are willing to take on all comers who have a gripe over one of Leonard's reviews. Marquis of Queensbury rules will be enforced, but anyone who wants to have a lively discussion is welcome to spar (verbally) with America's best-known film critic. Thursday July 19, 2018. 11:30am - 12:30pm. Room 24ABC. Doctor Who: BBC America's Official Panel: BBC America's Doctor Who panel introduces the 13th Doctor, played by Jodie Whittaker (Broadchurch). Marking a new era for the legendary Time Lord, Whittaker will be joined on the panel by two of her co-stars, Tosin Cole, and Mandip Gill, who play Ryan and Yasmin, as well as award-winning series showrunner Chris Chibnall (Broadchurch) and executive producer Matt Strevens (An Adventure in Space and Time). With this year's highly anticipated season packed full of action, adventure, humor, and emotion, this will be the cast's first-ever panel appearance ahead of Doctor Who premiering this fall on BBC America. Thursday July 19, 2018. 11:45am - 12:45pm. Hall H.
Tell Me a Story: Step into the world of Tell Me a Story, the latest project from the mind of Kevin Williamson. In this reimagining of the world's most beloved fairy tales, see "The Three Little Pigs," "Little Red Riding Hood," and "Hansel and Gretel" come to life as dark and twisted psychological thrillers interweaving with each other against the backdrop of modern-day New York City. Featuring executive producer Kevin Williamson as well as series stars Paul Wesley and James Wolk, for an exclusive sneak peek of the CBS All Access series followed by a panel discussion. Moderated by the editor-in-chief of Entertainment Weekly, Henry Goldblatt. Thursday July 19, 2018. 12:15pm - 12:45pm. Ballroom 20. 2001: A Space Odyssey 50th Anniversary Panel: Warner Bros. Home Entertainment (WBHE) and the Arthur C. Clarke Society take a look back across a half-century (and the distant universe) to celebrate one of the most iconic films in history. Panelists will examine Stanley Kubrick's science fiction masterpiece. Kubrick's Academy Award-winning achievement is a compelling drama of man vs. machine, a stunning meld of music and motion. For the first time since its original release, new 70mm prints were struck from pristine printing elements made from the original camera negative. A longtime admirer of the late American auteur, Christopher Nolan worked closely with the team at Warner Bros. Pictures throughout the mastering process. Building on the work done for the new 70mm prints, the 4K UHD with HDR presentation was mastered from the 65mm original camera negative. 2001: A Space Odyssey will be available on 4K UHD from WBHE on October 30. Thursday July 19, 2018. 12:30pm - 1:30pm. Room 6A. The Toys That Made Us: If you love toys and toy history, you'll want to join Brian Volk-Weiss (show creator/director) and the TTTMU team Robin Henry (executive producer), Ben Frost (writer/editor), and Rich Mayerik (producer, toy collector) for the same brand of fun and informative toy-talk you've come to love from the hit Netflix series. Discussion will include a Q&A on what brought The Toys That Made Us to life, what the future holds, and maybe even a surprise or two along the way. Thursday July 19, 2018. 1:00pm - 2:00pm. Roddenberry Presents: Roddenberry Entertainment, the name that brought you Star Trek, takes on genre entertainment in the current landscape and provides updates on many of their current projects. Film and television producers Eugene "Rod" Roddenberry and Trevor Roth reveal rarely seen Deep Space Nine treasures from the Roddenberry Archives in celebration of the series' 25th anniversary and present a special screening of the company's original film project, Instant, soon to be released to worldwide audiences. The panel will be joined by podcast hosts John Champion and Ken Ray, who will speak to the growing Roddenberry Podcast Network. Moderated by Clare Kramer (Buffy the Vampire Slayer). Thursday July 19, 2018. 1:30pm - 2:30pm. Room 24ABC. TMNT Reboot: Rise of the Teenage Mutant Ninja Turtles: Rise up! The Teenage Mutant Ninja Turtles are back in Nickelodeon's brand-new mutation of New York's half-shell heroes. Featuring Omar Miller (Ballers) as Raph, Ben Schwartz (Parks and Recreation) as Leo, Josh Brener (Silicon Valley) as Donnie, Brandon Smith (You're the Worst) as Mikey, Kat Graham (The Vampire Diaries) as April, and Eric Bauza (Teenage Mutant Ninja Turtles 2012) as Splinter. Joining the cast are co-executive producers Andy Suriano and Ant Ward and legendary voice director Rob Paulsen. Panel highlights to include never-before-seen clips from the upcoming series. Moderated by Buzzfeed's Keely Flaherty. Thursday July 19, 2018. 1:45pm - 2:45pm. Room 6A. So Say We All: 40 Years of Battlestar Galactica: Film and TV critic Scott "Movie" Mantz talks with authors Mark A. Altman (The Fifty-Year Mission) and Edward Gross (Slayers & Vampires) about their new oral history, So Say We All (Tor Books), an exhaustive look at the classic 1978 original series, Ronald D. Moore and David Eick's beloved 2004 re-imagining, and even the much maligned Galactica 1980. Find out the untold secrets and incredible true stories of these classic shows in this celebration of four decades of Battlestar Galactica. Win a chance to be the first to get a copy of the new 700+ page hardcover book autographed by the authors. Thursday July 19, 2018. 2:00pm - 3:00pm. Room 5AB. Bobcat Goldthwait's Misfits and Monsters: Crawl inside the twisted mind of writer-director Bobcat Goldthwait in this panel discussion and exclusive sneak peek at the genre-hopping truTV anthology series. Joined by moderator Eugene Mirman and panelists Jake Hurwitz, Amir Blumenfeld, and Tara Lynne Barr, the acclaimed comedian breaks down the inspirations behind his series' imaginative, satirical tales and the familiar film tropes that inspired them. Thursday July 19, 2018. 2:15pm - 3:15pm. Ballroom 20. Dragon Ball Super: English voice actors for Goku and Vegeta, Sean Schemmel and Christopher Sabat, talk all things Dragon Ball -and reveal never-before-seen material for the new movie. Don't miss some special surprise appearances, too. Thursday July 19, 2018. 2:15pm - 3:15pm. Hall H.
Nightflyers: From the mind of George R. R. Martin, this new SYFY series is a psychological thriller set in the year 2093 that follows a team of scientists aboard the most advanced ship ever built. Their mission takes them to the edge of space but also to the edge of insanity, as they realize true horror isn't waiting for them out there-it's already on their ship. Unlike anything you've seen before, Nightflyers combines horror and science fiction in a way that Martin himself has described as " Psycho in space." The cast and creators hold an exclusive look into this exciting new series. Thursday July 19, 2018. 3:00pm - 3:50pm. Indigo Ballroom, Hilton San Diego Bayfront. Marvel Animation: Marvel Rising: Marvel Rising brings together the next generation of Marvel superheroes for the next generation of Marvel fans. Be among the first to get a sneak peek at this group of powered teens and their adventures that are full of heart, action, comedy, and powerful messages for every kind of Marvel fan. The show's Quake Chloe Bennet (Marvel's Agents of S.H.I.E.L.D. ), Squirrel Girl Milana Vayntrub (This Is Us, Silicon Valley), Ms. Marvel Kathreen Khavari (Big Little Lies, Marvel's Avengers Assemble), Patriot Kamil McFadden (K.C. Undercover, Grown Ups 2), Cort Lane (SVP, Animation and Family Entertainment), Marsha Griffin (VP, Animation Current Series and Development), and Sana Amanat (VP, Content and Character Development) present an action-packed panel that showcases the first look of the animated shorts, special announcements, and so much more. Moderated by Lorraine Cink. Thursday July 19, 2018. 3:15pm - 4:15pm. Room 6DE. AMC's Better Call Saul: Bob Odenkirk, Rhea Seehorn, Patrick Fabian, Michael Mando, and Giancarlo Esposito join executive producers and showrunners Vince Gilligan and Peter Gould to discuss the series upcoming fourth season. New and familiar faces return as Jimmy McGill continues his evolution into the Saul Goodman persona that fans met on Breaking Bad. The panelists hold a Q&A session and an official preview of season 4, returning August 6 on AMC. Thursday July 19, 2018. 3:30pm - 4:30pm. Hall H.
Van Helsing: The World Is a Vampire: Now entering its action-packed third season, SYFY's Van Helsing continues the story of Vanessa Van Helsing and her band of heroes as they fight to reclaim the world after vampires took over during "The Rising." Stars Kelly Overton, Jonathan Scarfe, Missy Peregrym, Aleks Paunovic, Rukiya Bernard, Vincent Gale, and Trezzo Mahoro, along with showrunner Neil LaBute and executive producers Mike Frislev and Chad Oakes, premiere exclusive footage from the upcoming third season and dish out tidbits from behind the scenes. Moderated by Bevin from Den of Geek. Thursday July 19, 2018. 4:00pm - 4:50pm. Indigo Ballroom, Hilton San Diego Bayfront. We Wrote Your Childhood: If you're a millennial, chances are these panelists wrote the cartoons you watched as a kid. Paul Germain (Rugrats, Recess), Craig Bartlett (Hey Arnold! ), Sue Rose (Pepper Ann, Angela Anaconda), Holly Huckins (Recess, Angela Anaconda), Peter Gaffney (Rugrats, Ah! Real Monsters! ), Rachel Lipman (Rugrats, Hey Arnold! ), Matt Negrete (Pepper Ann), and Joe Ansolabehere (Hey Arnold!, Rece ss) talk about these iconic '90s cartoons. Q&A to follow. Thursday July 19, 2018 4:00pm - 5:00pm. Room 7AB. Breaking Bad 10th Anniversary Celebration: In celebration of the 10th anniversary of the premiere of Breaking Bad, AMC and Sony Pictures Television have reunited the original cast to take a look back at the best moments from this groundbreaking television series and reminisce about TV's most famous anti-hero, Walter White. Cast members Bryan Cranston, Aaron Paul, Anna Gunn, Dean Norris, Betsy Brandt, R. J. Mitte, Bob Odenkirk, and Giancarlo Esposito, along with executive producer and showrunner Vince Gilligan, look back at their favorite moments from the series and discuss the legacy the show and characters have left behind. Thursday July 19, 2018. 4:30pm - 5:30pm. Hall H.
Marvel Studios: The First 10 Years, Visual Development: The Marvel Studios Visual Development team comes to San Diego to share never-before-seen concept art and their favorite designs from the past 10 years. Thursday July 19, 2018. 5:00pm - 6:00pm. Room 25ABC. Crazy Ex-Girlfriend: The Final Curtain Call: As the critically acclaimed CW series enters its final season, come celebrate and take a trip down memory lane with co-creators Rachel Bloom and Aline Brosh McKenna as they look back on some of the series most memorable moments. The panel will be moderated by series guest star Michael McMillian and will include a special performance and never-before-seen footage. Thursday July 19, 2018. 5:45pm - 6:30pm. Room 6A. Assassination Nation Panel with Cast and the Russo Brothers: As if high school wasn't difficult enough already, imagine if every phone in your town was hacked, the contents shared for all to see, and you and your three best friends were framed as the hackers. Welcome to the explosive world of texting, terror, and teen-angst that is Assassination Nation. Already dubbed "the most aggressive high school movie in film history," Assassination Nation is being brought to the big screen by the Russo Brothers (Avengers: Infinity War, Captain America: Civil War), who will be joined by director Sam Levinson and the film's stars Bill Skarsgård (It), Suki Waterhouse (Insurgent), Hari Nef, and Abra for an exclusive look at what is sure to be one of the most controversial and cathartic films of the year. Thursday July 19, 2018. 5:45pm - 6:45pm. Hall H.
NBC's Brooklyn Nine-Nine: Thursday July 19, 2018. 7:00pm - 8:00pm. Indigo Ballroom, Hilton San Diego Bayfront. Stephen King's Mr. Mercedes: Season 2: Jack Bender (EP/director, Game of Thrones, Lost), Harry Treadaway (Penny Dreadful), Jharrel Jerome (Moonlight), Jack Huston (Boardwalk Empire), Holland Taylor (The L Word, Legally Blonde), Justine Lupe (Snowfall), and Breeda Wool (UnReal) give a first look at the new season of the AT&T AUDIENCE original series Mr. Mercedes. A year after his thwarted attempt to perpetrate a mass murder, Brady Hartsfield remains in a vegetative state, and retired Detective Bill Hodges has opened Finders Keepers. When unexplainable occurrences begin, Hodges has a feeling that Brady is somehow responsible. Thursday July 19, 2018. 8:00pm - 9:00pm. Room 7AB.